create the elegant look of shutters. They’re available in beautiful stains and paints, and feature a nice headrail for optimum light control. Behold the timeless look of a Shutter in a Wood Blind. Incorporating traditional Old World craftsmanship, Traditions Shutter Style Wood Blinds are as sensible as they are sentimental. They’re made exclusively from North American hardwood obtained from forests where sound forestry management helps to preserve our natural resources. Their unique 2 ½” beveled wood slats enhance your view when open. 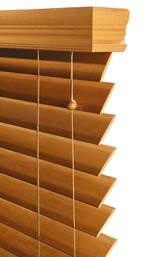 They’re available in many stains and paints to coordinate with other Wood Blinds.